Messengers 2 (a prequel to The Messengers) stars another favorite actor of mine; the brilliant and talented actor Norman Reedus. He plays a farmer, named John Rollins, that’s going through hard times. His trouble begins when his irrigation system is not working and can’t water his crops. He gets fed-up when the crows are eating his corn, and the bank is threatening to take his farm. To end his money troubles he decides to cut down the dead crops. As he grabs the sickle, he knocks down a fake wall. He finds a hidden door that he opens and discovers a scarecrow that is cursed by black magic. A creepy neighbor Jude Weathery (Richard Riehle) comes along and encourages him to put the scarecrow up. So, he puts it up not knowing that there is a curse on it with a price to pay. Then strange stuff starts to happen. People start to die and his crops start to mysteriously flourishing again. When John thinks all of his money troubles are behind him, he starts seeing things and hearing voices in the field. This causes his marriage to fall apart. His wife Mary Rollins (Heather Stephens) is drifting away from him because of his strange behavior. It seemed like John was being possessed by the scarecrow because in one scene it looked like John is going to kill his family. The last scene of this film shows the scarecrow walking and killing. This film will be great to watch during the month of Halloween and it is going to be in my next article that I’m writing. 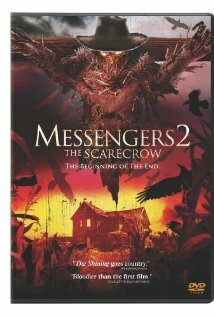 Comments for Messengers 2: The Scarecrow – The Beginning of The End / DVD Review are now closed.